I am excited about Poppy the pig being a part of the Put Me In The Story personalized platform because it's such an innovative and creative way to really engage a child's imagination within a book. There's no better way, in my eyes, for a child to connect with a story than when they are the star of it! So just like Poppy, I can see how Put Me In The Story will encourage kids to Dream Big! Picture books, by their very nature, are meant to entertain, inspire, and foster love. 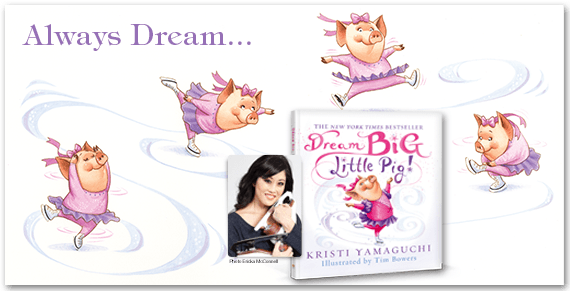 In Dream Big, Little Pig!, Poppy plans to do just that! Whether she's auditioning for Swan Lake, singing on Singing Stars, or modeling for Supermodel Search, Poppy gets support from friends and family. Like me, when she encounters the ice rink, Poppy finally realizes that this, in fact, is her dream. Regardless of how many times she falls, or how many people tell her she can't do it, Poppy persists. My older daughter, Keara, named "Poppy." I chose a pig because I have always loved pigs, was born in the year of the pig, and collected anything "pig" when I was younger. They have been good luck to me. And a pig did seem to present a fun personality that came along with her own challenges. Aside from naming Poppy, my girls gave a little feedback on what Poppy's wardrobe should be like. They are a good test audience and are very honest on whether they like the story or not! Poppy and the story were inspired by my two daughters. It was more about letting them know that dreams take hard work and there are challenges along the way, but they should never give up. My husband and I do try to encourage our girls to dream big and to be positive—all the while teaching them that it takes hard work too! Having been born with deformed feet, I know what it means to face adversity from personal experience. I wore plaster casts on my legs until I was a year old. When the casts came off, I wore corrective shoes connected by a brace to turn my feet until I was about two. Skating wasn't assigned to me, but when I expressed an interest in it at the age of five, the doctors said it would help. I remember seeing Peggy Fleming and Dorothy Hamill and wanting to capture the magic of those shows. Through persistence and hard work, I overcame my challenges and achieved my dream of becoming an Olympic champion. Like Poppy, I learned about adversity and the importance of perseverance. As the mother of two young girls, I'm hoping that Poppy will inspire kids to do the same. The motto "Always Dream" has served as my personal inspiration for many years. It is my constant reminder to dream big, never lose sight of my goals, and strive to become a better person. This book represents my desire to share that with children everywhere.